Green stones are the fashion just now; of these, of course, first comes the emerald, for green diamonds and green sapphires are too rare and small for modern jewelry. Nothing can equal a really fine emerald -- rich, dark, velvety and glossy -- yet it is said that a flaw or fault almost always lies in the stone, and an emerald without a flaw is priceless. 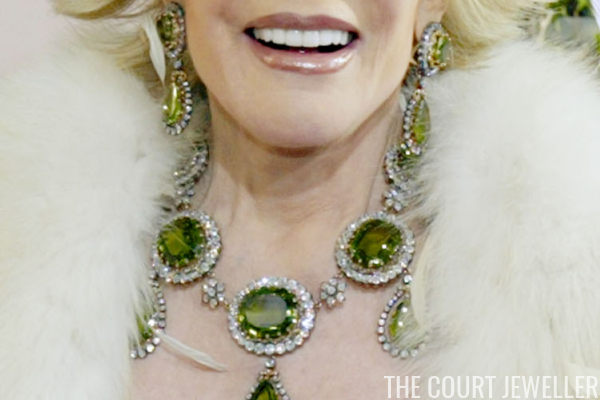 Read all about this necklace's royal connections over here! Next to emeralds come peridots (the French name for Indian chrysolite). These stones are particularly soft and they are difficult to cut and polish. Peridots, when really fine in size, depth and color, are lovely stones. They are a clear, deep leaf-green, showing almost yellow beside the blue tone of color of the emerald. 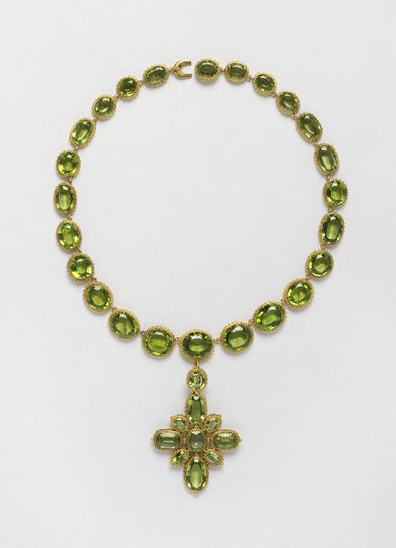 Few peridots are now brought into the market, and those sold are usually old stones recut and reset in modern fashion. Learn more about the set's history over here! Both emeralds and peridots are "step cut," with a large broad table of center space. The chrysoprase is pretty, but lacks depth of coloring. The reason the emerald and peridot make lovely ornaments is that they can be set round with sparkling diamonds to show off their lovely coloring, but pale stones like the chrysoprase or beryl have to be set plain by themselves, as they will not bear the contrast. 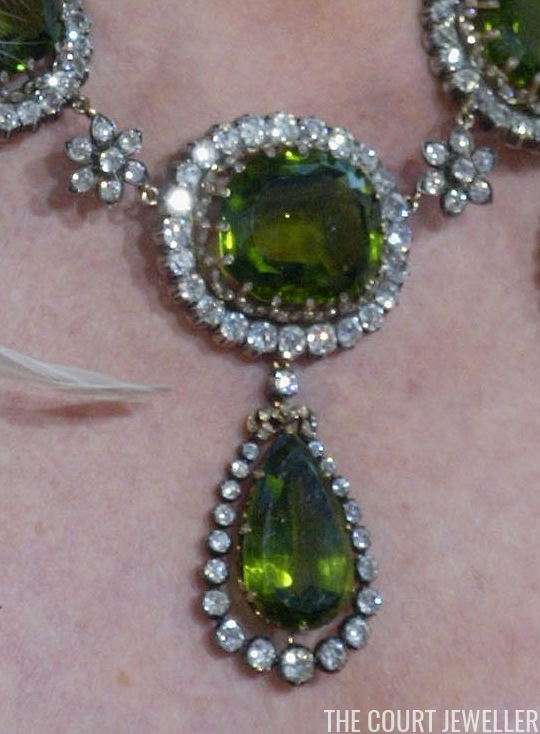 About twenty years ago a fashion came in of setting peridots with enamel and surrounding them with pearls. This fashion now seems to have returned.